STC’s Pre-Professional Ensemble classes allow students to tap into their imaginations by starting a lifelong relationship with theatre. In a nurturing, non-competitive atmosphere, students gain self-confidence while increasing skills in public speaking and cooperation. With concentration on character development, improvisation, and the rehearsal process, Ensemble Classes incorporate theatre games, scene study, and audition techniques for students with all levels of experience. Sessions culminate in a presentation of a play and/or monologues for family and friends. For questions, please contact the Education Office at 916-446-7501 ext 116 or education@sactheatre.org. 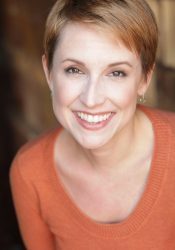 New to Sacramento Theatre Company, she’s spent the last few years working as an actor and teacher in Chicago and before that with American Shakespeare Center. She specializes in Movement and Voice for the Actor as well as Shakespeare’s Original Practices. Teaching credits: Associate Professor, College of Wooster; Theatre Faculty, West Virginia University; Instructor, The American Shakespeare Center; Co-founder of Checkered Flag Players, CA. Credits with the ASC: Lady Macbeth in Macbeth, Rosalind in As You Like It, ‘Tis Pity She’s a Whore, Henry IV part 1, Henry VI part 2, The Roman Actor, Much Ado About Nothing, The Merry Wives of Windsor, The Winter’s Tale, A Midsummer Night’s Dream. Chicago Productions: It’s a Wonderful Life: Live in Chicago!, King Lear, Other People’s Money, Caligula. With other theatres: The Crucible, The Mystery of Edwin Drood, Blithe Spirit, Honk!, Elizabeth Rex, The Last 5 Years, The Philadelphia Story, Blackbird, Dying City, A Flea in Her Ear.